Director of the Queen's China Liaison Office in Shanghai receives the prestigious Magnolia Award. Dr. Zhang (second from the right) stands with a group of recipients during the Magnolia Awards ceremony. Dr. Zhang poses with Weldon Epp, Consul General, Canadian Consulate General in Shanghai at the Magnolia Awards Ceremony. From left to right: Mr. Zhang Xiaosong, Director-General, Shanghai Municipal Government Foreign Affairs Office; Mr. Weldon Epp, Consul General, Canadian Consulate General In Shanghai; and Dr. Zhang. As a representative for Queen’s in China, Zhiyao Zhang keeps a busy schedule of connecting students with resources, managing collaborative programs with partners, and volunteer work. Recognition from the Shanghai Government has brought him international attention as a Shanghai Magnolia Award recipient. The magnolia is the official flower of the city. 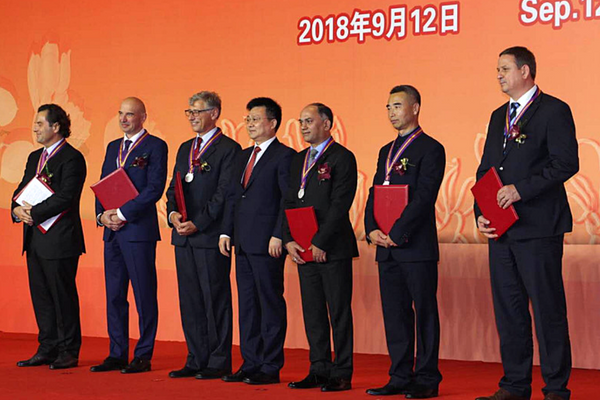 The Magnolia award is recognition from the Shanghai Government to foreigners who work in Shanghai and make great contributions to Shanghai’s development. Awards are granted to those working in economy and trade, finance, education, tourism, and communications. Roughly 50 foreigners are recognized every year since its inception in 2000. Many recipients are CEOs and Chairs of national and multi-national companies. Dr. Zhang and the Magnolia Award certificate. The Queen's China Liaison Office was established in 2007, located at Fudan University in Shanghai. The office seeks opportunities for academic and research collaboration with Chinese universities and government offices, recruitment of undergraduate and graduate students for degree programs at Queen’s, and maintaining links with Queen’s alumni in China. Dr. Zhang’s nomination was the result of over a decade of work representing Queen’s with Fudan University, Tongji University, Shanghai University of Finance and Economics (SUFE), China Executive Leadership Academy Pudong (CELAP), and the Municipal Government Foreign Affairs Office in Shanghai on collaborations in research, graduate and undergraduate exchange programs, degree programs, and official training programs. A Canadian Study Lecture Series at Fudan created to provide a platform for Queen’s faculties to lecture at Fudan. Indirectly related to his work, Dr. Zhang also contributes his time as a volunteer at the World Wildlife Fund (WWF) Shanghai Projects Office to promote nature education and works with a freelance ecologist and a farm manager to start the Good Earth Project, promoting eco-friendly agriculture and environment education. Both WWF and Good Earth Projects have now become informal research and teaching sites for Queen’s faculties and visiting students in Shanghai.